Received March 5, 2017; Revised March 29, 2017; Accepted March 30, 2017.; Published online March 31, 2017. It is important to identify cancer-related epigenetic regulators and their functions to understand cancer pathogenesis. Oncogenes were shown to be regulated by super-enhancers (Chapuy et al., 2013; Loven et al., 2013; Pott and Lieb, 2015), and aberrant regulation of eRNA is closely related to tumorigenesis (Li et al., 2013; Teppo et al., 2016). Herein, recent discoveries of aberrant super-enhancers and eRNAs in various cancer types will be discussed (Table 1). Fig. 1. Histone modifications to identify active enhancers marked with high H3K27ac, high H3K4me1, and low/no H3K4me3. 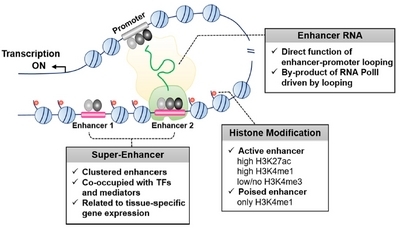 Super-enhancers are characterized by multiple enhancers co-occupied with lineage-specific transcription factors within tens of kilobases covered with extended H3K27ac. eRNAs are bi-directionally transcribed at enhancers and involved in promoter-enhancer interactions by binding with cohesin. Fig. 2. 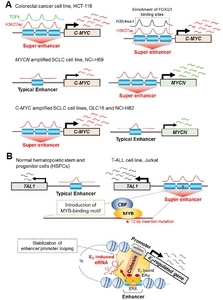 (A) Enrichment of super-enhancer associated with the MYC gene family in colorectal cancer and small cell lung cancer cell lines (B) TAL1 super-enhancer in T cell acute lymphoblastic leukemia cell lines (C) Stabilization of E2/ERα/eRNA-induced enhancer-promoter looping in breast cancer cell lines. Gabay, M., Li, Y., and Felsher, D.W. (2014). MYC activation is a hallmark of cancer initiation and maintenance. Cold Spring Harb Perspect Med. 4. Jiang, Y.Y., Lin, D.C., Mayakonda, A., Hazawa, M., Ding, L.W., Chien, W.W., Xu, L., Chen, Y., Xiao, J.F., and Senapedis, W. (2016). Targeting super-enhancer-associated oncogenes in oesophageal squamous cell carcinoma. Gut. Le Noir, S., Laffleur, B., Carrion, C., Garot, A., Lecardeur, S., Pinaud, E., Denizot, Y., Skok, J., and Cogné, M. (2017). The IgH locus 3′ cis-regulatory super-enhancer co-opts AID for allelic transvection. Oncotarget. , , and Fantom Consortium (2016). Enhanced identification of transcriptional enhancers provides mechanistic insights into diseases. Trends Genet. 32, 76-88.